To the small group of Bayview residents who braved Monday’s rain to come to the district police station, Capt. Steven Ford said he was “absolutely shocked that there hasn’t been more of an outcry and concern about” the police killing of Keita O’Neil, 42. Officer Christopher Samayoa shot and killed 42-year-old O’Neil on Dec. 1. O’Neil was unarmed and Samayoa was on his fourth day of the job after graduating from the Police Academy. Ford, who as a kid passed time in the Bayview, said that he did not know why or when the Bayview had become a training station, which means recent graduates of the Police Academy are posted there. When one attendee said he believed the community deserved to know why Bayview was a training station, Ford promised to get more information for the next meeting. In the wake of the killing, Ford began holding meetings every other Monday where community members could discuss the killing of O’Neil. Ford said he will continue to hold the meetings until the community says they’re done. Samayoa and the training officer he was with at the time have both been removed from the Bayview Station. Ford said the police’s criminal investigation is now in the hands of the District Attorney. 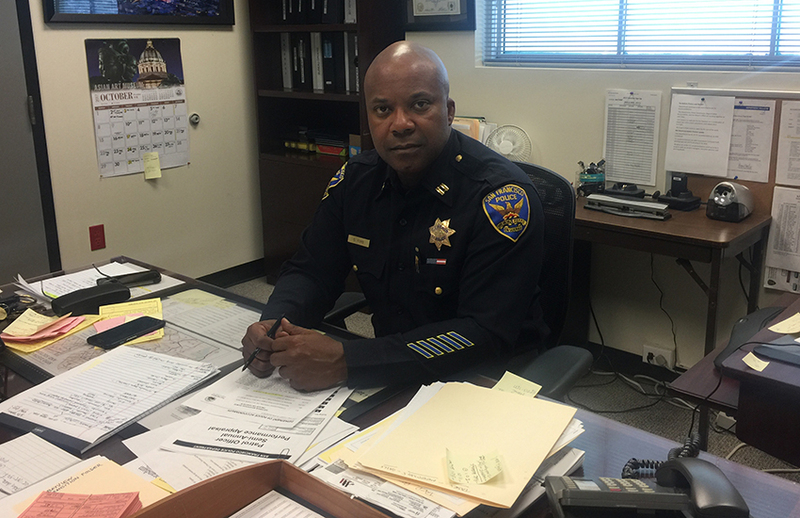 SFPD’s Internal Affairs investigation will begin only after the District Attorney announces his decision on whether to file criminal charges — a process that has taken years in the past, despite recommendations that such investigations proceed in a more timely manner. Ford said that while Samayoa was still in his probationary period, the investigation process is the same as for an officer involved in a shooting. However, it is unclear if Samayoa could be suspended or fired more easily because he was not yet a full-fledged officer at the time of the shooting. Despite Ford’s willingness to keep the community informed, 57-year-old Kevin Brooks, a lifelong resident of the Bayview, said that people have lost hope in the police. “Give them my number,” Ford told Brooks, but acknowledged the difficult task of winning the community’s trust. A week after the killing, the SFPD showed the police body-camera footage at a town hall held in the Bayview. The footage showed that Samayoa was sitting in the passenger seat of a police car when he pointed his gun out of the window and shot O’Neil as he ran past. O’Neil had robbed a California lottery vehicle, and police had chased him through the Alice Griffith public housing complex. Bayview native Loretta Wilson, who has come to all four meetings, says they’ve been educational. But while community members may be getting to know and trust Ford, it is unclear how much that trust is extended to the rest of the department. “I feel like it’s progress, but we need more people to get involved. We need to get rid of all the bad apples,” said Brooks. This article has been corrected. Capt. Steven Ford was not born and raised in the Bayview. The mistake was ours. The reason there has not been a community reaction is O’Neil and him group have been making their living off the people in this area – for years! Even the jungle wanted him dead. Capt. Ford u took over the station and didn’t know it was a training site? U didn’t know u had armed rookies – 4 days on the job? There won’t be any charges-this was justified.